During the first week of October, a coin jar was placed in each Lovelady elementary classroom and at the front office to collect money for the annual Coin War, a donation drive where students are encouraged to bring spare change from home that will be given to a charity. Instead of a traditional charity this year, students chose to donate money to the Region VI Education Service Center’s VGo program, which brought a robot to the district for sixth grader Morgan LaRue to use while she recovers at home from recent surgery. “We usually kind of fish around for something that is related to the school in some way, and this year we chose to help put money toward purchasing another robot, which has allowed one of our students, Morgan LaRue, come to class and join us at school,” Elementary Principal Debbie Harrelson said. The VGo robot is a machine that is controlled wirelessly with a laptop, and uses a two-way camera so the laptop user can see on their screen everything that the robot sees and hears. 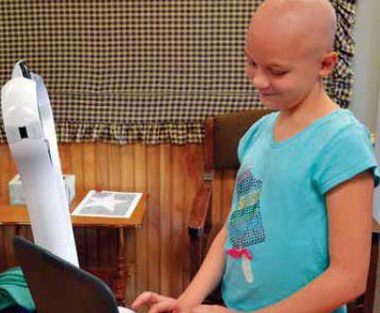 Because of this machine, Morgan can sit in bed and, through a computer, experience a normal school day. The school raised a total of $2,545.08 and presented a check to Region VI representatives at the school board meeting Monday, Nov. 19, to help buy another VGo for other districts in the region to use. “I think it’s just awesome of the school to do that,” Ashley LaRue, Morgan’s mom, said of the donation. “Nothing will take the place of being able to be there with your friends and being in that classroom,” Region VI systems engineer Kip Robins said. “That teacher asks a question and being able to hear those other responses - you don’t get that on a piece of paper and we have the technology now to get all that,” Robins explained. The robot has a screen that will show Morgan in real time so her teachers and friends can talk to her, and the VGo has speakers so when she talks, everyone can hear. By using her mouse or keyboard, she will control the device’s movement in real time. “She’s not going to be able to come to school – but with this she’ll be able to go about her day and interact with friends and go about her day just like if she was here. “She’ll actually be able to change classes, be with her friends during lunch, so it will actually be an interactive day,” Lovelady ISD technology assistant Dakota Ham said. Morgan went after school about six weeks ago to learn how to use the device she then nicknamed MoGo, the week before she had to go to Houston for limb salvage surgery. She has a rare form of bone cancer, osteosarcoma, and had a tumor in her right leg that had to be removed. Doctors replaced the missing bone with a titanium implant that will expand as she grows, which she had done in 2010 on her left leg and made history as the first patient in the United States to have the expandable implant. “I just think it’s beyond amazing that the school district and Region 6 was able to provide such an opportunity for her. It has been such a tremendous help compared to the first time we went through this,” Morgan’s mom, Ashley LaRue said. The district was able to get the VGo from Region 6 Education Service Center for the entire school year, at which point then the district may purchase one of its own. For all of the perks of the machine, the cost would be roughly $6,000, Ham said. In late September, VGo was brought to the school where Ham began to test the machine, and he learned how to control it so he could later teach Morgan, and also to get students acclimated to a robot roaming the halls. Basically, the machine is controlled by a single computer, which Morgan now has, over an Internet connection. Using the computer, Morgan calls the machine and it connects - and her full screen becomes the video that VGo is capturing. With either the arrows on the keyboard or a mouse, Morgan controls how the machine moves, like rolling down a hall, turning and stopping, and if she runs into something she gets a “bump” message. Additionally, there is a remote control that comes with the machine that Morgan’s teacher will have to operate VGo it if need be. Once the day is done, or VGo is running low on its six-hour battery, it returns to a rechargeable doc in the technology room. Morgan has used the VGo to go to school twice so far, joining her class around 9 a.m. once they got back from first period band and began working on math and science. She was able to sit up in her bed while wearing her pajamas and participate in the school day. Even though she had used VGo to go to class, a teacher still went to Morgan’s home to go over instructional material with her later in the week. Instead of the teacher having to recap the entire lesson, Morgan was able to just ask a couple of questions and then complete her work. “It will put her back more in a regular routine… that will give her daily instruction and more of an opportunity to be right on target with her class instead of only having that instruction a couple of times a week,” LaRue said. Currently, the VGo is on loan to Lovelady from Region VI for the rest of the school year, and is the only one the center owns. However, with the help of the students’ donation, Robins said he can see the program expanding. “When we don’t need VGo here anymore, VGo will go to another school and we’ll continue to grow this program for students just like Morgan - students that run into hard times like this,” Robins said. “And this will be a program that will continue to grow, and always remember that this program started in Lovelady and we appreciate it . . . This is a reflection of the parents and teachers here and we appreciate it very much.